The Braak (Village green) in Stellenbosch is an open area about the size of two rugby fields. It borders Bird Street which on one side has modern shops and offices while on the other the history surrounding the Braak. 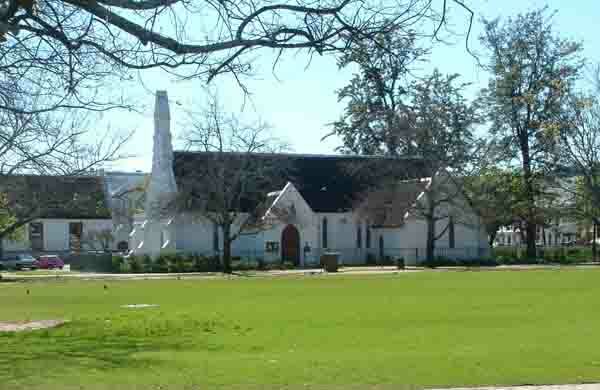 The first building we come across on the northern side of the green is St Mary's Church which was built in 1852 and is an example of the type Cape Dutch architecture that was in fashion in the 1850's. To the west are a number of buildings and the most interesting is the old VOC Kruithuis which was built in 1877. Kruit is the Afrikaans and Dutch word for gunpowder and ammunition and this building was used to store the local supplies for the Dutch East India Company. Its round roof is not thatched like all the other other buildings of that era but is built of bricks to protect the ammunition stored in it. Outside its main gate are two cannons that date back to the 1800's as well. In the old days the Kruithuis was on the outskirts of the town but due to the growth of Stellenbosch which is the second oldest town in South Africa it now finds itself in the centre of the town. Two other old buildings can also be found on the Braak. They are the Coachman's Cottage and the old Burgerhuis. 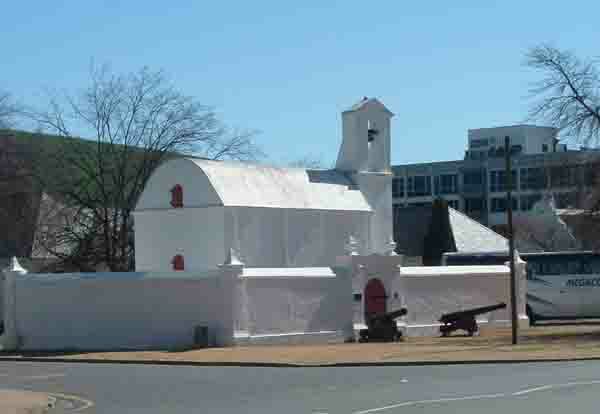 On the southern side of the green is the lovely old Rhenish church which dates back to 1823. It was built by missionaries and was inaugurated on the 5th February 1824. The northern wing was faces the Braak was added in 1840. 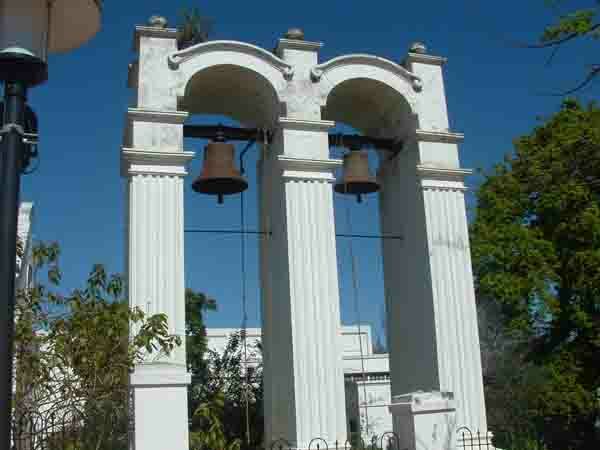 Very interesting are the two church bells which hang closeby in the church garden. Both of them still have their bell ropes so are obviously rung on Sundays to invite worshippers to worship. Lettering on the bells is in German so they must have been cast in Germany and brought to South Africa. Also to be found on the Braak is the P J Olivier Art Centre which houses an educational centre for the arts. Most of the old buildings around the Braak have been declared national monuments and as such are not allowed to be altered in any way. Stellenbosch is a very beautiful old town with hundreds of oak trees dating back to the time of Simon van der Stel who was the instigator of them being planted there. No visit to Cape Town is complete without a visit to the Stellenbosch area. When you come to Cape Town on your next visit let me show you around and explain some of the local history to you. In addition to all the history there are enough wine farms and places to taste the wines to make your head dizzy.